French trader Jerome Kerviel (right) leaves the Paris courthouse on June 25. (CNN) -- Defense lawyers wrapped up their case Friday for French trader Jerome Kerviel, who is on trial for allegedly betting 50 billion euros ($61 billion) of a French bank's money without its knowledge. A former employee of the Societe Generale, Kerviel went on trial earlier this month on charges including forgery, breach of trust and unauthorized computer use. The bank says the unhedged bets cost it almost $6 billion. Kerviel, 33, would face a penalty of up to five years in prison and a fine of up to 375,000 euros (about $460,000) if found guilty. Societe Generale also plans to ask that Kerviel reimburse it for its losses, which it discovered in January 2008. Kerviel's attorney, Olivier Metzner, asked jurors during his closing arguments Friday to acquit his client of the charges of breach of trust and forgery. Kerviel has pleaded guilty to a count of computer abuse. 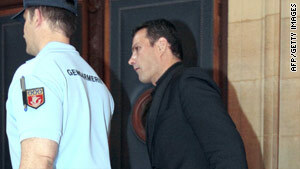 As he left the court, Metzner told CNN that Kerviel's behavior was strongly influenced by the environment at Societe Generale. "The banks are the ones to blame for the banking system and the systematic economic crisis, not Jerome Kerviel," he said. Kerviel, who is free on bail, traded European index futures for the bank. He claims he did everything with the knowledge of his superiors. "I am convinced the criminal file is full of elements proving that my superiors knew and covered for me. At least I shouldn't be the only one in the dock," he told CNN after the release of his memoirs, "Trapped in a Spiral: Memoirs of a Trader" in which he pleads his innocence. "During three years, these managers earned colossal amounts of money out of bonuses based on the ever-growing results that I was making for the bank," he said. Societe Generale says that at no time were supervisors aware of Kerviel's alleged unlawful activities. The judge in the case has said a verdict in the trial will be handed down October 5.